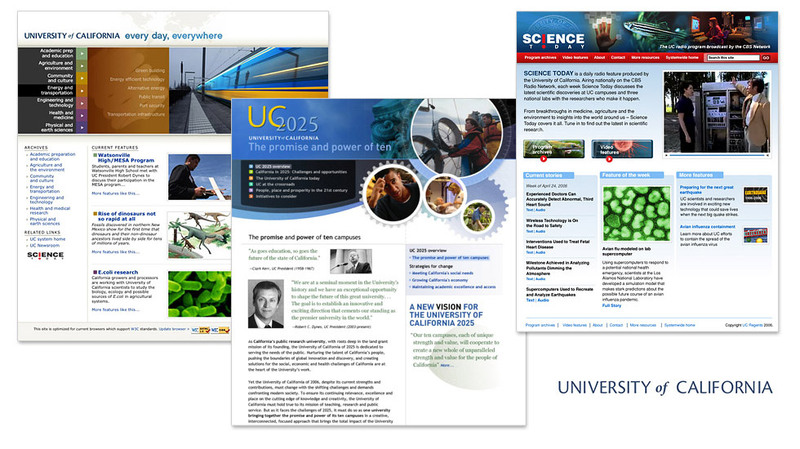 As a lead visual designer for The University of California’s Office of the President, I developed dozens of advocacy-related Web sites, eNewsletters, and other digital communications for both internal and external audiences. The overarching goal, no matter the subject, was to communicate the significant contributions UC made to improve the health, education, and economic prosperity of all Californians. A few examples include UC: Every day, everywhere (multimedia feature stories about UC research), UC2025 (a site about long-term planning) and ScienceToday, the online home of a weekly radio show produced by UC. Lead visual design, identity design, content strategy, front-end programming and Flash development.